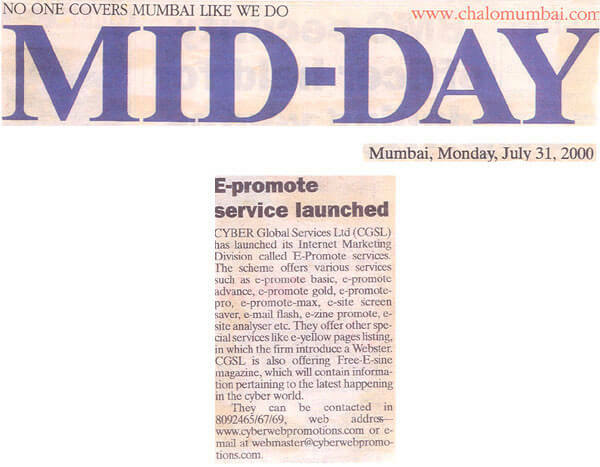 In a brief announcement published July 31, 2000 in Mid-Day, a publication that covers Mumbai, the publication is announcing electronic promotional services offered by one of the predecessors of CGS Infotech. The Mid-Day clipping shows how long this company has been successfully serving the search engine optimization and Internet marketing needs of companies of all types. Specifically, the announcement is about Cyber Global Services and the then-new E-Promote service that offered email services, ezine services and many other things with names that now seem dated. Still, similar search engine marketing and Internet marketing services are still being offered by CGS Infotech and are still getting good results for clients of all types. Similar programs to enhance website traffic, get more leads and boost revenues are available to you today. The process starts with a free 15-minute telephone training session that explains Internet marketing, search engine optimization and more. To benefit from this free service and learn more about what CGS Infotech can do for you, please contact us now. This smart decision will serve you and your company well for years to come. You’ll see greater traffic to your site because of better search engine placement. From this, you can get more leads and eventually more revenue, something any business would be pleased to have.